There are two types of tooth removal methods: a simple and a surgical extraction. A simple extraction is used when it is fully visible above the gum line, such as a primary tooth that has not fallen out on its own or to relieve overcrowding. 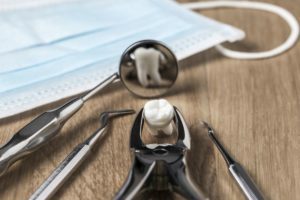 When a tooth is not visible above the gum line, such as due to an impaction or a significant break, you need to see an oral surgeon in Arlington. They must remove gum tissue and bone to extract it and the surgical site is closed using sutures. Why Do I Need a Surgical Extraction? The recommendation to surgically remove a tooth is not a decision your Arlington dentist makes lightly. Instead, they base their advice on a visual examination, as well as the information they gather from a digital x-ray. If the tooth is easily accessible your dentist creates a treatment plan for a simple extraction. In some cases, a simple extraction can later turn into a surgical one, such as if the tooth breaks while trying to remove it. Most often, a surgical extraction is needed for the removal of impacted wisdom teeth. Anesthesia or sedation is used during your procedure to ensure your comfort. Your oral surgeon opens your gum to expose the tooth. It is not uncommon for them to remove pieces of tissue or bone before carefully breaking your tooth into smaller pieces. After your tooth is out, your gum tissue is sutured closed and the healing process begins. It is normal to have some pain, swelling, and bruising for a few days. You can help to alleviate it using pain relievers and cold compresses. It is best to stick to a liquid diet and soft foods for at least the first day. Be sure to avoid anything that may cause the blood clot to come loose too soon, such as vigorously rinsing your mouth, smoking, or drinking through a straw. If you need to have a tooth surgically removed, you have nothing to fear. Your qualified and experienced oral surgeon will safely and effectively extract it to improve your oral health. Allheart Dental Implants & Orthodontics provides advanced dentistry from our modern office. We offer an array of services catering to your individual needs, including tooth extractions. If you need to have a tooth removed, contact our office today to schedule your consultation.